A graphically illustrated guide to various oddities about color and light. You'll find various amusing contradictions about the perception of color. Have you ever wondered how many pictures (or movies!) you could ever ever ever see? Did you know that blue and yellow actually makes grey/white (well, it's true!). Then there's the 'Mirror Timebomb' - see how a sphere in the shape of a mirror can explode if lit from the inside. Also, the shocking news - "Is your monitor displaying a fake green?". You'll not only find it probably is, but have a chance to see what /real/ green looks like. 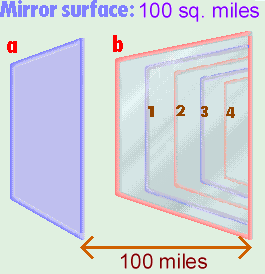 'Light 'build up' when mirror faces mirror; on gigantic scale! The amazing spherical mirror timebomb. What do you get if you mix blue and yellow? Green? Bzzz - incorrect. How much information are our eyes receiving every second? How many uniquely different pictures or movies could one ever, ever see? Is your monitor displaying a fake green? Mirror facing mirror on gigantic scale! There have been various ways of measuring the speed of light - from using precision engineered rotating wheels... to the 'nudges' of the stars caused by stellar aberrations... to Galileo's classically inaccurate lamp test (visit http://www.what-is-the-speed-of-light.com for more info), but there's a spectacular visual more fascinating than any of these which will now be revealed! a: If you switch on a light bulb, nothing would happen at first, but then after 2 to 3 seconds, you would then see a bright light bulb hanging in mid air - everything else would remain pitch black. c: Shadows would remain pitch black for a little longer! Remember, what usually stops the shadowy parts of the room from remaining pitch black is that the light bounces off the other parts of the room and reaches these shadowed areas. If the light was slowed down to 1 metre per second, these shadowed areas would gradually lighten up as more and more parts of the room reach them. e: Finally, if you then tried switching off the light, the shadows have their revenge as they are the last pieces of light to reach your eyes! NB. I found out that one of these five effects is actually wrong! See if you can guess which one it is. Post up to Skytopia Forum once you think you know - or post up some extra effects that I haven't thought of! Anyway, all this sounds very interesting, but it is... entirely theoretical. Light will never travel that slow (though see the on/off MPEG video near the bottom here for a CGI demo). For things to be visibly slowed down, things need to be done on a grand scale! Take a look over to the diagram on the left. 2 mirrors are facing each other - simple huh? As you probably know, this has the effect of dozens of mirrors appearing inside each other. But imagine if these mirrors were 100 miles wide/long and were distanced at about the same length. You're there - right in front of the blue mirror - looking directly into the red mirror. The first thing you would see of course is the red mirror itself. Then you would see the blue reflection inside of this. Click the picture for a full screen version! 25,600 miles and 256 reflections in 1/7 second ! This is just about big enough to be seen and slow enough for some weird stuff to happen. Try rotating one of the giant mirrors slightly or shooting across a large object in between the mirrors at high speed! After you're done, the next task is to create a 100 mile diameter mirrored sphere and go inside. Hours of fun as your reflection 'multiplies' in the sphere. Imagine if you will a mirror..., and not just any mirror, but a specially designed spherical hollowed out mirror. The mirror is the surface of the sphere but on the inside. Now add some kind of light source inside (a light bulb will do for now). Turn it on and what do you think would happen? The moment in time just before the whole thing 'exploded' - caught myself by a special heat sensing camera (wide-focal lens) - located outside and looking into a tiny 'pin-hole' in the mirror's surface. 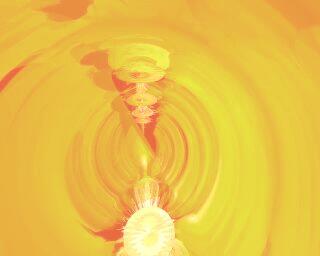 As the light rebounds inside the sphere, the intensity grows and grows - as light is rebounded for the umpteenth time - and more light is continually being pumped out from the bulb. It has nowhere to go! a: The inside will become brighter and brighter as light builds up - and countless more photons are swimming inside. b: The air and surface of the sphere will become hotter and hotter - as light is turned into heat. Yellow + Blue = green" ?????? (bzzzzzz). False. Secondary colours (ink primaries): Magenta, Yellow and Cyan. White should also be classed as a secondary color, because it is still based on the primary colors (all three of them). Examples: red+green=yellow, magenta+yellow=half saturated red, red+yellow=orange. The brightness (value) will vary according to whether you're using chess board style colour splitting (average), translucency (average) or monitor style 'mixing' (addition). But the main thing to remember is additive mixing will always keep the hue and saturation constant. Multiplicative mixing is more commonly known as subtractive mixing unfortunately - see this site). Examples: red*green=black, magenta*yellow=red, red*yellow=red. Light filters are a perfect example of multiplicative mixing. So are most dyes and inks (think of felt tip mixing). What type of mixing does paint use? Mixing paint is not so simple, and neither multiplicative or additive mixing will do. It turns out that the mega-complicated Kubelka-Monk formula is needed to precisely find out the mixed color. It can very roughly be approximated to something like the geometric mean or 'minimum' function, but this a dirty shortcut, as it won't take into account things such as light scattering and the precise absorption spectrum of the paint etc. It as a long held myth among the general population that blue and yellow equal green. The concept is ingrained from primary school and is often assumed even at college/university level... It is of course incorrect. There are two main ways of mixing colour - additive mixing, and multiplicative mixing (This is more commonly known as 'subtractive' mixing, but mathematically, this is incorrect). In either case, blue and yellow will always make white/grey or black. 1: When people see the colour Cyan - they think they're seeing 'light blue'. They're not. If you try mixing a more cyan-like blue, then naturally a certain amount of green will be produced. 2: There's no such thing as pure 'blue' paint (i.e. no such pigment that only stimulates the eye's 'blue' cone). Or rather we don't have the technology to create it yet. In other words, what's seen as blue paint contains many wavelengths of light around the green part of the spectrum, and obviously that's going to produce a muddy green if it was mixed with yellow. 3: On top of both those factors, there's also the possibility that complex chemical reactions within the paint would distort the hue. See this site for a quick overview of the impurities in inks and paints. All of these factors combine to make it confusing, but the fact remains that real blue and yellow can only ever make a hueless colour - white/grey/black. To demostrate further, why not experiment with translucency in your favourite paint package. Likewise, Green + Magenta = black/white, Red + Cyan = black/white. The color wheel in the diagram to the right will show these colors are opposite each other. If you're interested in mixing colors and light generally - visit this excellent site which clearly explains color mixing, and how the three ink primaries are Cyan, Magenta and Yellow, NOT Red, Yellow and Blue: http://home.att.net/~RTRUSCIO/COLORSYS.htm. Here's another site giving the advantages of the CMY model. Can we really see in ?? False. We cannot see in 3D at all - but 2D. Sure, the information we receive is from a 3D world, but the image projected onto each eye is only 2D. If we could see in true 3D, then we'd actually see /behind/ stuff - even opaque objects. The image projected onto our eyes is a 2D image, and we have 2 eyes, so it's (x*y)+(x*y), not (x*y*z). No doubt it'd be a case of information overload if we really did see things in 3D. 10,000*10,000 pieces of information for each eye. Multiply this by a factor of two for each eye and then further multiply it by 24 (8 bits for Red, green and blue) to represent the 16 million colors we see. So far we've reached a number of 4,800,000,000. Then multiply that by 100 for the bits of info we receive every second and we end up with the not too small number of 480,000,000,000. Not even the most powerful super-computers or the latest optic technology can match the intricacy of our eye. How many different hour 'movies' could we ever possibly see? Now let's increase this to a visual area of 3 by 3 pixels - and a slightly less miniscule palette of 3 colors (one more than before!). I'm not going to draw all the possibilities, but there are loads - 729 to be precise (or 93). One only has to now increase the amount of colors possible from 3 to 4 and you get 6561 possible combinations (94)! Now is where the big numbers come in. How many unique colors could we actually see? At this point we've got to be careful - we can distinguish between a lot more than '16 million' colors if we include the various brightnesses that are not available on the average monitor. For the sake of this test, I'm going to give a number about 4 times larger than the 256 amount of brightnesses available on a monitor... - say about 1000*1000*1000 (RGB). So we've got 1 billion (1,000,000,000) colors and 100 million (100,000,000) pixels to shape our vision. Now all we have to do is calculate what 100,000,000 to the power of 1,000,000,000 is. Simple if you know how. Most calculators can't handle numbers as big as this, so there's a trick involved. You just work out the logarithm of 1,000,000,000 - which is 9 'digits' (looks like 10 but we use 9 in our calculations). Then we multiply this amount (9) by 100,000,000. This covers every single picture you could ever possibly see. From a picture of you - to a picture of your own house, to a picture of the ocean or sky - every possible sight is contained within this number! Note that is only the amount of digits the number contains. To print the number out in full would take up millions of pages and around 2 CDs!!! OK, let's say, we watch a movie - lasting an hour. How many movies could you ever possibly see? We want to calculate that 900,000,000 digit number to the further power of 3600*100. That's 3600 seconds in an hour and 100 frames per second to convince us we're seeing actual smooth animation rather than just a load of stuttering pictures. Ooooh, I bet you won't see a number bigger than that. It would be gigantic enough even if it wasn't referring to the number of digits. Bearing in mind that if you were to add even one digit to make 324,000,000,000,001; this would make the number ten times as big! To store all these pictures onto CDs would in fact require a number of CDs not much greater than the number we had in the first place..... Well, it /is/ much greater, but only by a few thousand digits - which is kinda nothing at this level. Is the green on your monitor display a fake imitation of the real thing? Yes it's true - the green you've been so used to may well be a poor quality imitation! It's a common problem with many TVs and monitors and as far as I know, it could well apply to all cathode ray tube and LCD displays. What actually makes the green so poor is a fair amount of red (and a bit of blue) contamination. This makes everything that's coloured green on your monitor white-yellowish. Because cyan is made up of the poor green element, this also tends to be a very pale imitation of the real cyan too. To test how good your monitor is, there are two simple ways. The most efficient way requires you to have a special green plastic see-through filter (you might have something like this without realising - get those 3D glasses - one side has a green filter!). If you do have something like this, then skip to the sub-heading "So what does this 'real green' look like then?" - otherwise carry on reading. OK, you'll need to wait until late so that the room will be dark once you switch off the light. Then refer back to this doc. Now get a CD (preferably a recordable CD - as the silver sides tend to be shinier). Now in your favourite paint package, fill the whole screen with green. Make sure there's nothing except green on the screen (a black border doesn't matter of course if it can't be helped). Once you've done this, use the silver side of the CD and tilt it at various angles to reflect the screen. You should be able to see a disc of light on the silver side of the CD. In the middle, is the colour of the green screen reflected. But on the edge of the colour band ring, you should see a faint red aura. On the inset of the main rim you should also be able to see a tinge of real green. If so, this proves your monitor is as faulty as the rest of them :) If on the other hand, you can only see one tone of green - then lucky for you! - your monitor is an exception to the rule. "So what does this 'real green' look like then?" If you have a green filter (get those 3D glasses - the green see-through plastic in them is ideal! ), then you'll be able to see what it will look like. Otherwise, well..., I can't magically produce a true green for you, but the best I can do is show you a table showing what could be next. 255,255,0 176,255,0 0,255,0 What next? Stop press: There is a brilliant way you can see true green and cyan without resorting to filters or CDs. Visit the Optical Illusions page and look for the "Eclipse of Mars" illusion. For those who have the green filter, take a look at this below. I have adjusted the shade of the color to be as dark as the filter will show. Unfortunately, the brightness of the green isn't marvellous (because you're using a filter), but at least you'll be able to see a (fairly dark) /real/ green. Put the filter over the white portion on the right. (for those looking via green filter) - Now, that's how real green should look!! In comparison, the 'green' on the left looks very muddy. Shocked? You should be. As far as I know, the saturation level of green is about as bad with both TFT/LCD and CRT monitors. Apparently, the future of display technology - OLED - has much better color saturation. Maybe some of you are going to say "ah... - all you have to do is brighten/darken the green shown, and then I bet it will appear as green as how the filter shows". For you lot, here's a color chart - showing dark 'green' (0,0,0) to bright 'green' (0,255,0). Nowhere will you find a green as pure as the filter shows. For the ultimate proof; put a red filter over the bright screen square shown to the right. If the square was truly green, then the filter overlay should make it black. Since, it isn't, there must be some red light coming from the fake green, and therefore through the red plastic filter. 240,144,112 240,96,64 240,0,0 This box represents the next jump for real red. You might well know that the colors that we see reside in a relatively tiny portion of the electromagnetic spectrum - from 400 to 700 nanometres. 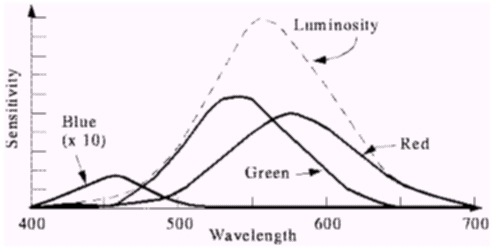 At the limit of these points (ultraviolet and infrared), they decrease in intensity until nothing can be seen at all. At the fine range of the visible light spectrum - exists violet. This is interesting because red is needed to mix with blue to get a similar color to violet. At least /some/ red is needed... but hang on a minute... red is all the way near the beginning of the light spectrum! How can this red mix with blue (to produce the aforementioned violet) if they're miles apart?! This seems to imply that if we /could/ see further along the invisible electromagnetic spectrum, the colors would wrap round and we'd see red, green and blue, red, green, blue again and again and again, but the truth is a little more subtle than this. To understand what's really happening, I first need to explain that the eye uses three types of cones: red, green and blue. 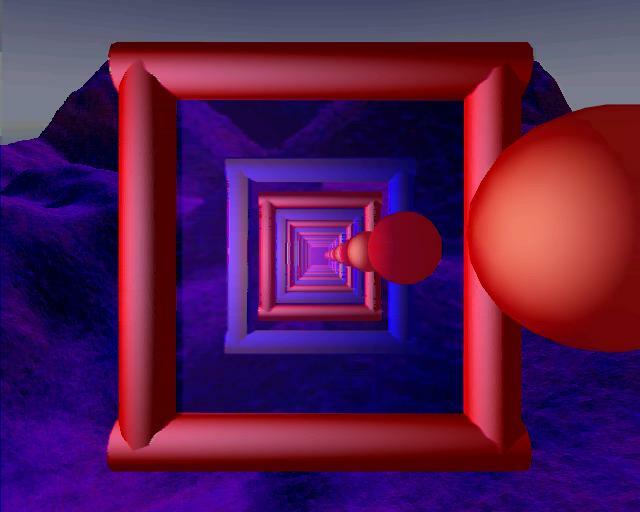 Wavelengths of light around 700 nanometres stimulate the red cone. For the green cone, it's around 550 nm, and for the blue - about 450 nm. But our eyes have a slight quirk about them - when a wavelength near the blue end of the spectrum (approx. 450nm) activates our blue cone, it also (very slightly) activates our red cone too! 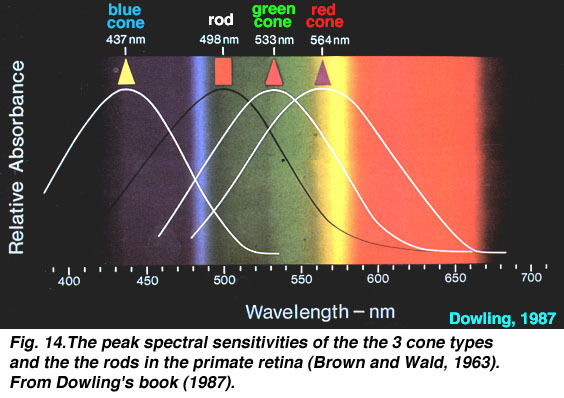 Note that this doesn't happen the other way - red wavelengths don't stimulate the blue cone. However, they're all slightly wrong. Not only do they all contradict each other slightly :) but they fail to show the small (but very real) red cone response of blue wavelengths. See where the red curve gets 'second helpings'? It shows how wavelengths around the blue area will unexpectedly activate the red cone slightly. In other words, we'll never be able to see what true blue really looks like! Light bulbs - why cream? Ever since Edison invented the light bulb, every household up and down the globe has had to put up with the same cream light bulb. It's a pity, because white would accurately reflect the true colors of objects. Is it because of technical difficulties why white light isn't common-place - or is it because people prefer the 'warmer' tones that cream light provides? Anyway, back to the cream bulb business. Exactly how cream are they? I put the theory to the test. For the sake of the experiment I have to assume that the monitor white really is true white. First, I got a piece of paper - a white piece of paper. I then used the RGB (red, green, blue) sliders to try and match the shade of the paper. What RGB values will produce the apparent 'white' of the piece of paper? Here's a quiz to demonstrate the idea. I realise your light bulb might have a different brightness, or that your monitor may be darker or lighter, or even that you might be holding the piece of paper at a different distance or angle, but give it a shot - I think you might be surprised. Make sure of course it's evening and the curtains are closed to block any light from outside. Which box is closest (in terms of hue /and/ brightness) to the shade of a piece of white paper? Once you've answered this question, read on. It's a total shock at first. That dull dark brown really is approximately as bright as the brightest shade in your dull-lit cream room!! Depressing huh? Worse still is the amount of blue in the average light bulb - a very miniscule 14%! Now was this very suspicious orange color (shown below) going to match the theory? I eagerly moved the paper closer to the light - and using trial and error, adjusted the angle so that it would be darker/lighter to try and match the shade on the screen. Was it the same hue??? Very close indeed - I was right. The thing you must remember is that stuff looks less apparently orange when everything around it is also tinted with the same color. The eye 'adapts' and creates a new standard for 'white' according to what it sees. So even though this orange looked too orangey for the bulb's light, it's only an optical illusion (in the same way it's an optical illusion that it looks darker on screen than in real life). For another real-life example of what I mean, visit this page here. Colours can easily appear to be something they are not. Anyway, it worked - closing the paper on the light source made it brighter and it was identical to the bright 'orange' hue on the screen. We really are seeing everything Orange-ey in the evening! 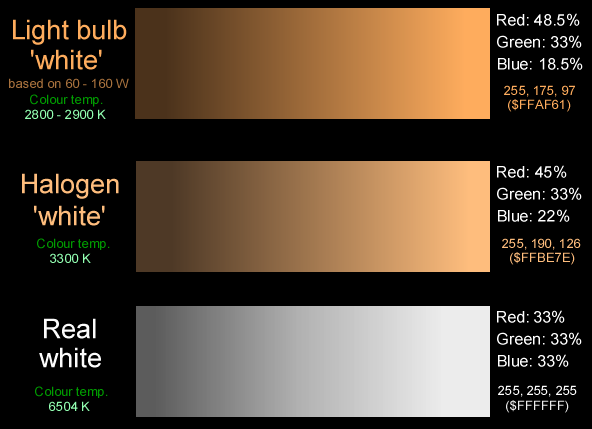 Incredibly, it's this exact hue of orange (51% red, 32% green, 17% blue - (255,163,84))....(only much, much brighter) that 60 watt light bulbs use to radiate stuff. Pathetic - I know. 100 watt light bulbs don't fare much better either. It's this exact hue (49% red, 33% green, 18% blue - (255,169,93))....(only much, much brighter) that it uses to light up everything. Also pathetic. A proper white light bulb would need about 3 (!) times as much blue and over 1.5 the amount of green. Now try finding the brightest red you can find. Perhaps you'll find a bright red cover off a magazine or food item. 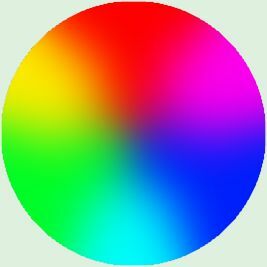 What RGB color shade from the monitor do you think it's closest to? World's Most Unanswered Science Questions - light - - - Further trivia on light presented in Q&A style. Email me or visit Skytopia's Whirlpool of Knowledge Forum.